Searching for a Finnish Lapphund? 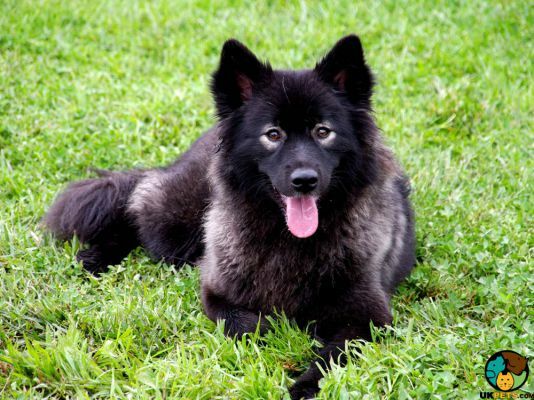 The Finnish Lapphund is a Spitz-type pastoral dog breed that dates back to 7000 BC. It is a pure breed in its own right, accepted by The Kennel Club in 1945. It's a medium-sized dog that stands 41 to 52 centimetres and weighs between 35 and 53 pounds. It is famous for its easy-going and friendly personality. Its boundless energy makes it a perfect companion for outdoorsy families. Are you ready to own a Finnish Lapphund? Before you decide, here is a brief background of this ideal outdoor companion dog bred for work. When tracing the history of a Finnish Lapphund, you'll be surprised to learn that this dog breed has been around since the 7000 BC. During this period, they were referred to as the Lapland dogs, derived from the northern region of Finland, Sweden, and in part, Russia. 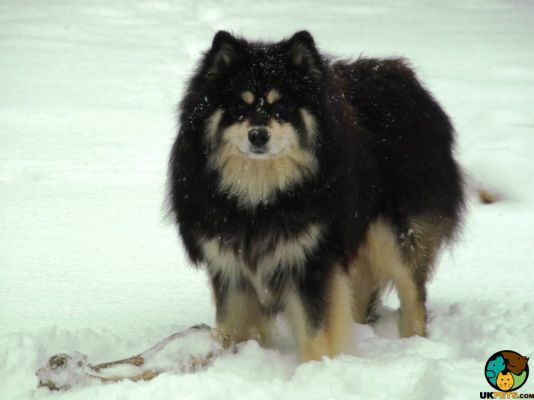 The Finnish Lapphund was originally bred to help the nomadic Sami in herding reindeer. The breed almost did not survive extinction due to the arrival of snowmobiles. Luckily, some breed enthusiasts started a breeding program in 1940. In the same period, the dog breed was officially accepted by the Finnish Kennel Club. Five years later (1945), The Kennel Club followed suit, accepting the Finnish Lapphund as a breed in its own right. 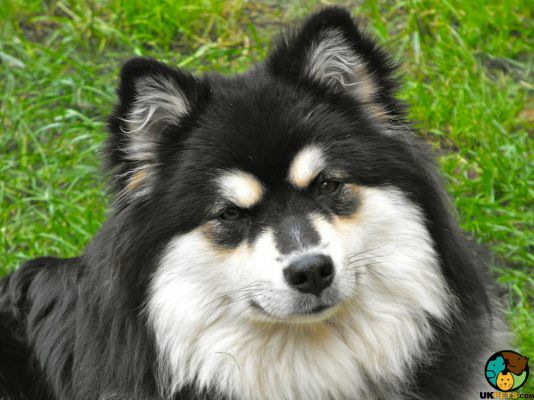 The Finnish Lapphund resembles the appearance of Spitz-type dogs, but still, its distinctive look is not to be mistaken. It is a medium-sized breed that stands 41 to 52 centimetres and weighs between 35 and 53 pounds. Finnish Lapphunds must be slightly longer (from chest to rump) than they are tall (from shoulder to floor). Their body is definitely thick, but not compact or stocky, most of which is obscured by its relatively dense coat, hiding well-muscled form underneath. 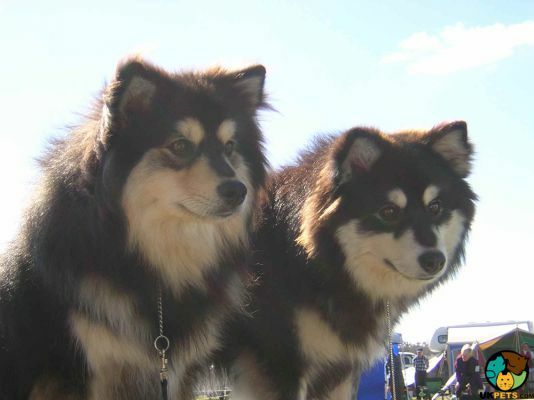 The Finnish Lapphund's thick coat comprises a soft, dense and abundant undercoat, while the topcoat is straight, long and harsh to touch, not to mention it is water-repellent. Its coat can be wavy for young dogs but must always be adequately harsh to be acceptable. Colour combinations of the coat consist of a single colour and a secondary colour limited to the head, neck, chest, legs, underbelly, and tail. Among the accepted colours are black, tan, white, brown, cream, sable, grizzle, red, and even tricolour. When it comes to its coat a Finnish Lapphund leans toward the high-maintenance grooming department. As expected in taming dense and heavy coats, one must do a daily brushing to remove loose and dead hair. Brushing is also necessary to avoid the formation of any matts or tangles. Never neglect other areas of grooming, if you don't want your dog ending up with infections. Make sure to pay attention to its mouth, teeth, ears, and nails as well. 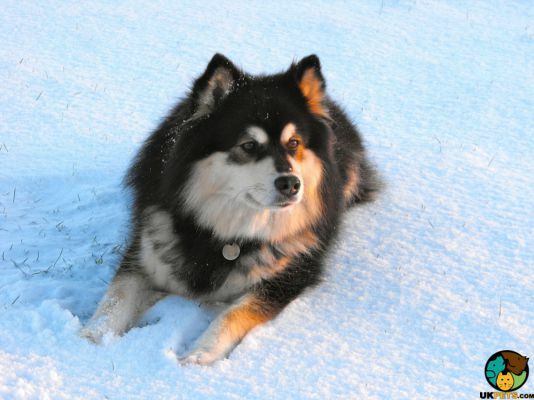 If you can manage an intelligent and active breed, then do consider a Finnish Lapphund. This dog breed is intelligent enough to excel in obedience, herding and agility trials, not to mention they can be trained to be excellent therapy dogs. The Finnish Lapphund is indeed an excellent watchdog, albeit slightly excessive. This breed will likely bark at anything that is unfamiliar. Its affection is also often tempered, despite its friendly nature, often fawning over select family members and reserve to some. Regardless, the Finnish Lapphund undoubtedly loves its family to the point of suffering from separation anxiety, although not all. When around children, the Finnish Lapphund is friendly and affectionate. It likes nothing more than to be a part of the family, playing and interacting. However, it is foolish to let Finnish Lapphunds and young kids mix without supervision. Doing so is a recipe for disaster, as anytime playtime can turn too boisterous, which may cause unintentional hurt. Keeping a Finnish Lapphund with other animals, especially small ones, is okay as long as the dog has been socialised when young and these animals were actually raised together. Owners must remember that the Finnish Lapphund's herding instinct may kick in, and it will try to herd other animals. A typical serving for an adult Finnish Lapphund is 1 1/2 to 2 1/2 cups of premium dry dog food per day. It is important for meals to be divided into two meals to avoid the risk of bloat. The Finnish Lapphund doesn't require a special diet, but to ensure that you're providing sufficient nutrition, it is best to consult with a veterinarian for advice. Owners need to take note that Finnish Lapphunds, being northern breeds, can have slower metabolism, which means they are prone to weight gain. It is important to make sure food is measured and to definitely avoid free-feeding. The Finnish Lapphund can have a long life of up to 14 years. Others even lived up to 17 years in Finland. However, this can only happen provided that owners take good care of the dog, which includes making sure it does not suffer any preventable illnesses. Health issues to watch out closely include Hip and Elbow Dysplasia, Cataracts, Glaucoma, Progressive Retinal Atrophy, and Glycogen storage disease. Being an outdoor-loving breed, Finnish Lapphunds have high exercise needs. They will need to get at least 30 minutes to 1 hour of vigorous exercise and will enjoy hikes, runs and jogging. 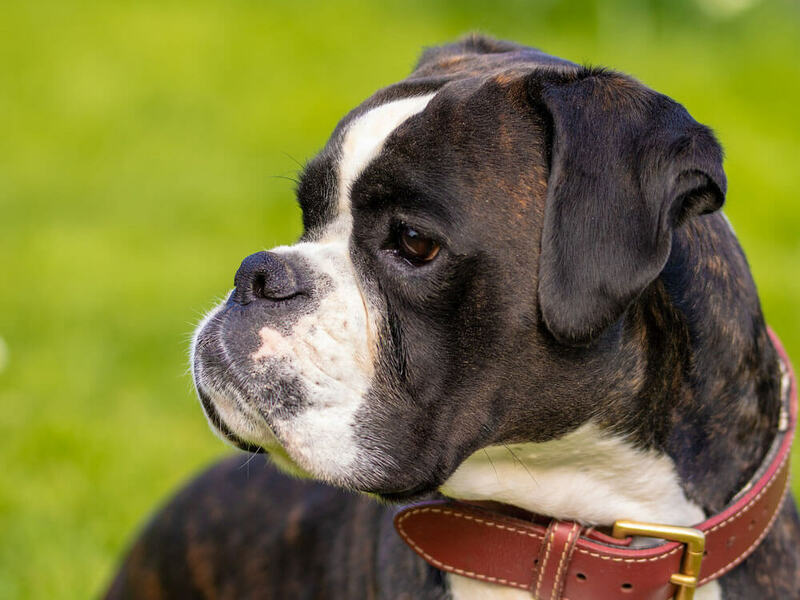 With the level of exercise required, this dog breed will need owners who are happy to commit themselves to being active and spending time outdoors. Finding a Finnish Lapphund will be quite a challenge, not only financially but also due to the fact that it's a rare breed. 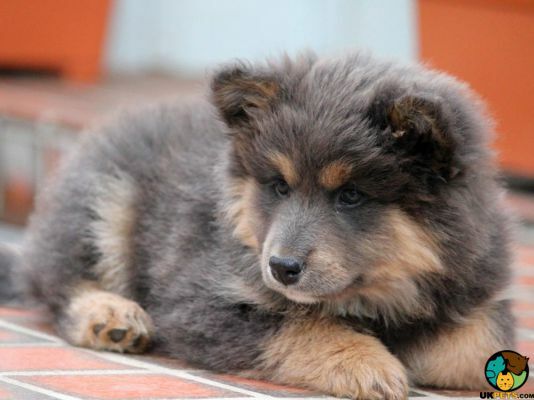 However, being put on a waitlist is not that bad if you are eager to own a Finnish Lapphund puppy. One perk of waiting is having a longer opportunity to set aside enough funds for its purchase and the cost of raising it. Lapphund puppy (well-bred pedigree) costs £950. Pet insurance, depending on coverage, costs £20 to £40 a month. Veterinary consultations (including vaccines, boosters etc.) cost up to £1,000 a year. High-quality dog food will set you back £30 to £40 a month. Rough estimated cost to own and care for a Finnish Lapphund is somewhere around £60 to £90. Is a Finnish Lapphund Right for You? The Finnish Lapphund is a pastoral (herding) dog. It is easy to train and excels in obedience, agility and herding trials. Finnish Lapphunds have high exercise levels and love the outdoors. They are high-maintenance when it comes to caring for their coat. They are affectionate and friendly dogs. 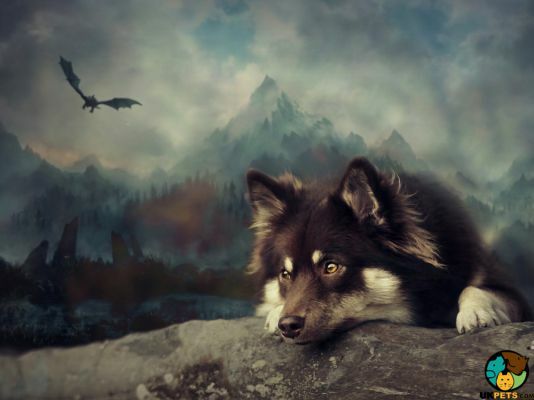 The Finnish Lapphund is an excellent watchdog.